Everyone wanted to get their hands on Preacher. In the late 1990s, Kevin Smith urged mega-producer Harvey Weinstein to finance a movie adaptation of Garth Ennis and Steve Dillon's gory, supernatural comic book. Didn't happen. In the 2000s, HBO tried and failed to convert the Vertigo series to television, where each episode would correspond to a single issue. Oscar-winning director Sam Mendes also attempted a movie version, with special-effects makeup tests even surfacing online, before turning his eye to the James Bond movie Skyfall. So why did AMC's version of Preacher take? 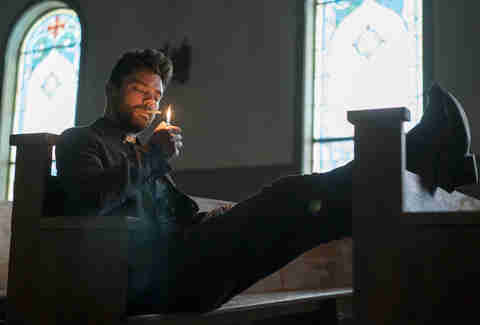 Breaking Bad alum Sam Catlin -- who developed Preacher with actor Seth Rogen and his collaborator Evan Goldberg, and who now serves as showrunner on the grungy, grisly series -- says it's all timing. "You needed to have a certain amount of groundbreaking, big-swing-success shows for people to take the big swing on Preacher," says Catlin. "AMC had a lot of success doing shows that shouldn't really work on paper. Mad Men and Breaking Bad seem like no-brainers in hindsight, but, at the time, those are shows that shouldn't have worked. Preacher is the same. It's definitely a TV show that shouldn't work. Audiences expect a sort of audacity now -- there's so much competition and so many great shows that are really pushing the envelope." "We always loved the idea that it looked... bad," says Catlin. "It looked sort of early '70s, sort of thowback-y. 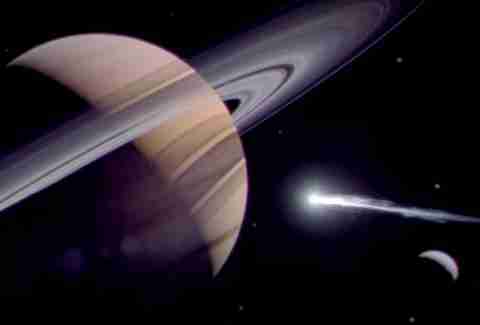 Preacher takes place in the present day, but we sort of put in older technology and [the space scene] went with the show's aesthetic somehow. We also knew that we wanted to be able to go to places like outer space and Africa and stuff like that, and that's just the nature of Garth's comic: it goes all over the world and has these huge set pieces. "We knew that we weren't going to be able to afford to make those things look real. The more we thought about it, the more we thought about we didn't want it to look real. It has this sort of theatrical, hand-made quality about it that we sort of like. This is a sort of created world. It isn't Breaking Bad where everything is sort of meticulously naturalistic. This is a created world, a sort of a parallel world. [Walking Dead] is the real world plus zombies. This world, even without vampires and angels, there's something a little bit sideways and cooked about it just going in." "Is it the most violent TV show? I mean, it's probably one of the bloodiest, but some of the violence, a lot of the violence in my view, is meant to be sort of tongue-in-cheek. It's meant to have that sort of Quentin Tarantino or even Monty Python type of sort of playful violence. We had the same makeup person on Preacher that we had on Breaking Bad. When someone got a cut on their lip or they fell on Breaking Bad, it was meticulously phased out. Every injury, every wound, was steeped in naturalism. But on Preacher I'm like, 'Yeah, you know what? He got punched there, but it can start to go away.' It's not meant to be as real." "We really wanted to see Jesse be a preacher in something more than name only," says Catlin. "We wanted to see what his investment was, and how much he'd invested in God and the idea of religion and the idea of him being saved, because he's done terrible things and he is literally, like so many Americans are, certain he is going to Hell because of all the terrible things he's done, stretching all the way back to when he was a young boy. We wanted to see what was at stake for him here in this town, and basically the challenge he set out for himself is that he's going to try to much as he can save the souls of this town. "Annville isn't like any other town. This is a town that's really just soaked in sin. It really is in some ways a Sodom and Gomorrah. That's what we're teasing out, over the course of the season. Once we get to know, not just Jesse and Cassidy more, but the people who actually live in this town, and the history of this town, and secrets that exist in this town, and all of the sin and all of the rot and corruption and grief and all of those things. "That's sort of what Jesse is trying to bring God to, while he's dealing with often supernatural entities and angels and vampire hunters and all of that. Jesse has a real, direct and hopeful relationship to God in the beginning. Eventually, the scales will fall from his eyes and he'll understand what's really going on with God. That's where the show really begins." "Why would someone like Cassidy end up in a small town like Annville, in west Texas?" says Catlin. "Cassidy always strikes me as a big city guy. What would make him be in this little town? How could we bring him into Jesse's life in a way that's organic? There was no better way than to have him literally fall from God. "Look, I'm not as cinematically fluent as Tarantino. He's an expert on all these different influences. I'm just copying whatever it is he's copying. We're copying him, we're trying to copy the Coen brothers, we're trying to copy David Lynch, we're trying to copy Python, we're trying to copy Clint Eastwood, we're trying to copy John Ford. We're trying to copy all of these different elements that we love that all work on their own. The big challenge of the show, is have all of those different influences live in one universe. That's the tone we're trying to strike." "[Seth and Evan] are big Breaking Bad fans, and... we have homages that are coming up," says Catlin. "We have some pretty big ones. If you are a true Breaking Bad fan, you'll see by the end of the season we do tip our cap very strongly to the show. 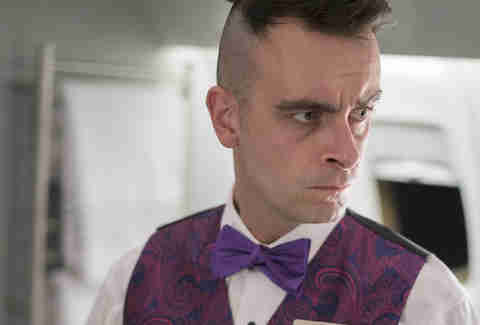 Which is part of the fun of Preacher. 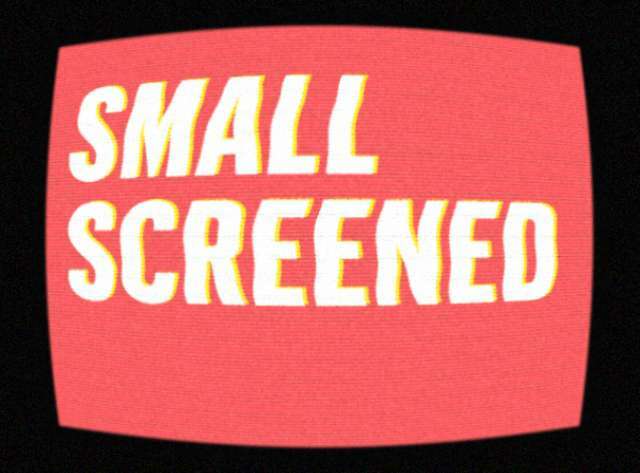 On Breaking Bad, it's not going to be self-consciousness. It's not going to say, 'this is a TV show' because it's very much steeped in Walter White's reality. Preacher lives in a sort of a meta, self-referential world where it's like, 'Oh, yeah. Hey, Breaking Bad is over there, two houses down on the right. There's Walking Dead over there.' It has that sort of self-consciousness that can be a lot of fun." "We always were going to have him," says Catlin, "and once we realized we were going to set so much of this first part in town... If Root's going to be there, then you've gotta have his son there. You've got to have Arseface. "I didn't want to do a hit job on religion. Seth and Evan are millionaire Canadian Jews. And drug addicts. I'm the secular humanist from Massachusetts. We do, amazingly enough, have two Christians on the writing staff. One is a Jesuit Priest, and another is a Christian woman whose parents are west Texas ministers. So I didn't want to do a TV show written by Hollywood liberals about how religion is the root of all evil. There are certainly characters that believe that, and they will give full voice to that on the show, but our lead character is religious. Our lead character, in the beginning is a preacher. He's an active preacher. Everyone has to have a good argument for their beliefs, whether it's atheism or Christianity or whatever it is. To me, everyone has to have a good argument. "To me, it just would be too easy to write a show about where religion is hypocrisy. It's so much of what's wrong with America these days anyway. People start talking past each other. Christianity, is a huge part of what makes America 'America,' and Preacher is about, if nothing else, America. So we really wanted to talk about what does religion means to people in this country." "Preacher is journey," says Catlin. "It's a quest. Basically, season one is sort of packing up all of the information that Jesse needs to know. By the end of the season, Jesse will understand what's inside him, who else is after it, what it means, and what it has to do with God. The answers to all of those questions will sort of fuel his quest. 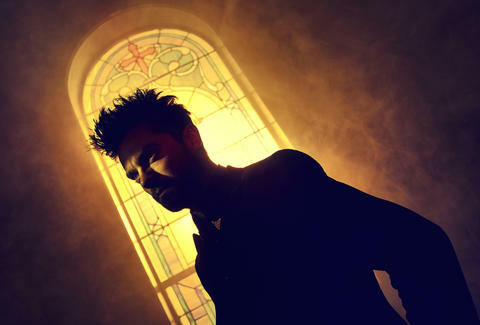 Then Preacher will sort of 'begin.'" 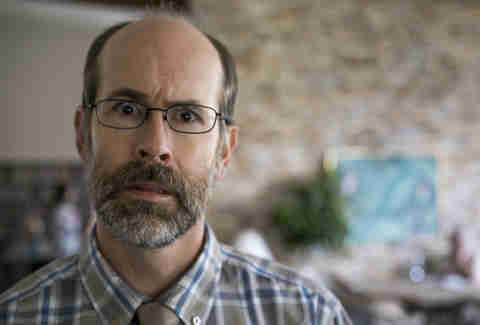 The scene: Ted (Brian Huskey) "opens" his heart to his mother. "Seth and Evan had worked with Brian on This Is the End," says Catlin. "He was just fantastic. I mean, we wasted so much time just making him do extra takes just because it was so funny. He's great. We're already working on ways to keep Ted Reyerson still in the universe. [Carving out your heart] doesn't mean we're done with you. Not on Preacher." Matt Patches is Thrillist’s Entertainment Editor. He previously wrote for Grantland, Esquire.com, Vulture, The Hollywood Reporter, and The Guardian. The Monty Python name drops in this interview make him giddy. Find him on Twitter @misterpatches.